of course wore it yesterday but just found time to post it now. so of course I had to try this out. today, I hope it is as magical as one! I am immensely jealous of your snow day. Immensely. Your coat is so awesome, though. It's so Tenth Doctor chic! Ahaha... yes. Normally I am not a fan of kitten heals either, but yours are really pretty. And I simply adore red, it´s a wonderful colour. What a wonderful outfit! The dress is so lovely and the coat absolutely great! Beautiful as always. I LOVE that polka dot dress!! I'm actually wearing polka dots myself today :) too funny! But I really, really love that dress and the pop of red from the shoes is divine! this outfit has two of my favorite things at the moment. polka dots and camel/beige! you look beautiful! those tights are amazing. you look awesome! I love red and camel too! And the polkadots bring it all together! Good evening for me, it's 08:33 pm here in Belgium :). Love your outfit! Good combination! Yay for snow days - and I love the shoes, they look brilliant with the coat. I love your bag and tights! I'm really starting to like kitten heels (although I don't own any), esp. these little red numbers! I'm also experiencing a snow day! Feels great to stay in, read and surf the web. a lovely coat, got similar lately!great inspiration how to wear it;) u look gorgeous! This coat is amazing Bonnie! Simply gorgeous! I'm totally into the 50's housewife style, so those kitten heels are just too adorable for words to me. fab! love your coat & bag! Lovely red and camel combination. 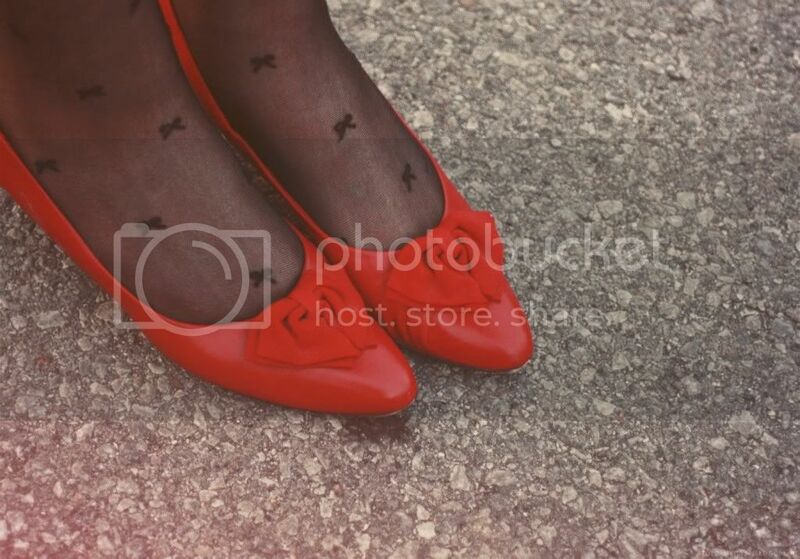 This is lovely, I love these vintage red shoes, such a good find !! I'm in love with your outfit!! Your tights and shoes are sososososo CUTE!! A snow day sounda fabulous! How do you get such a beautiful light in your photos? They are always so gorgeous! such pretty little shoes! i'm normally not a fan of kitten heels either, but these are just adorable. OMG, Your blog is one of my favourite fashion blogs. You rock ! First: You look so beautiful. Second: I love your outifits, which are amazing. Third: I love your 'vintage' style. camel was definitely my favourite colour of the season by far. I especially love my camel coat and i bet you do too! i love the dress! what a great find. i bought a camel coat from ann taylor 2 yrs ago and it was my best purchase to date! they are the best. This outfit is amazing. It includes all my favorite elements: red, camel, and dots! Beautiful combination. You look so sweet. Congrats on your Urban Outfitters styling internship! When you said you were going to Philly, I knew it had to be something cool involving either Urban, Free People, or Anthropologie. And I was right! I wish you the best of luck with it this upcoming summer. I know you will be stellar! Oh, I want your shoes, so sweet! Yeah... I basically love everything... again. I mean, how do you manage to come up with so many completely perfect outfits every day?! You are just too brilliant. And hurrah for snow days! Lucky! It's looking pretty white outside, so I am really hoping for one tomorrow myself. Can't wait to see all the snow pictures! Lovely shoes! not a fan of tiny heels either, but wouldn't mind those are so cute, totally 50's perfect housewife! ... Looking forward to see snow post soon! Lovely tights!!! They are so so so so cute :) Awesome outfit! Now these shoes are HEAVY! I like it so much. (I do have similar ones in dark blue). But what is really neat is the combination of red & camel. this coat is amazing! i've been pining for one like it all winter! eeep. although its now in the 60s in california...! Did you get this dress at Grey Dog? It looks just like one of the polka-beauties that Molly had not too long ago. I wanted to invite you to be a participant in a session on my blog called "Know more about:" This session is for other girls who know more about the girls who think they are super fashionable and blogger. If you say yes, I'll send you the questions in an email (that I didn´t find here), then you answer me and send me some photos that illustrate your answers. Kisses and I hope your answer. ive seen your outfit here in lookbook before and i still love it! 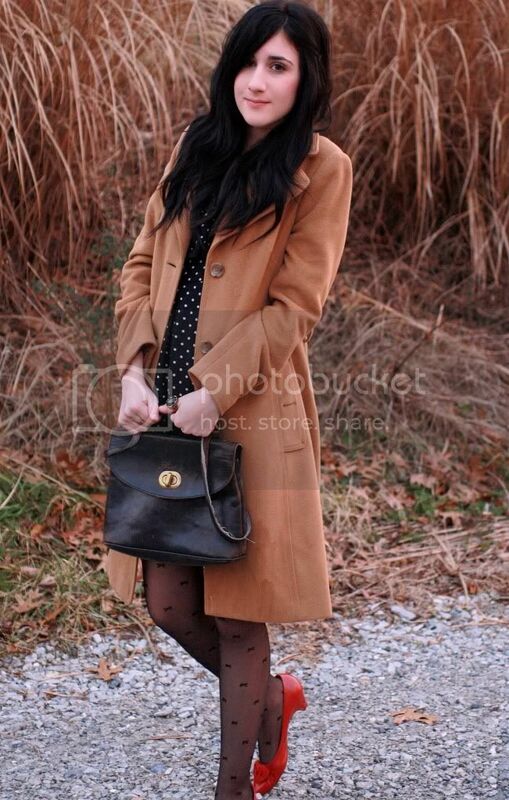 in love with your camel trench and polkadots dress. 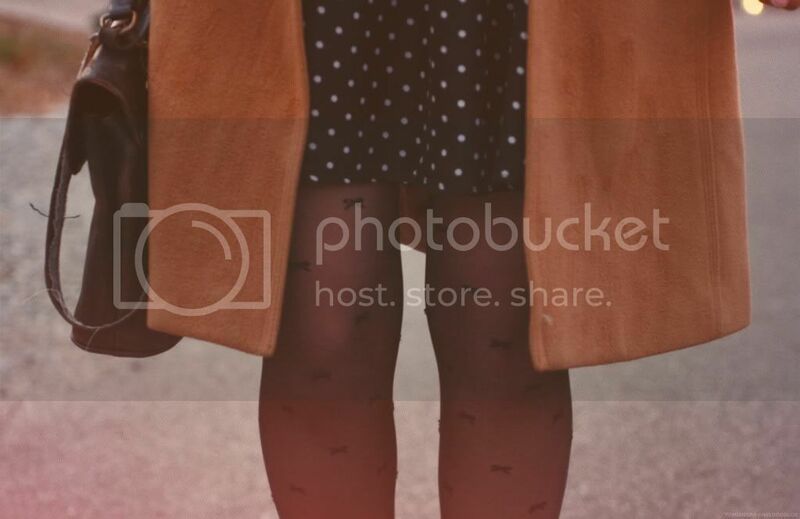 above all it's cute on how you paired bow tights with such pretty red shoes! Oh and, yes, those kitten heels are TDF! I adore kitten heels. They do remind me a lot of shows from the 50's but I guess that's pretty classic style. I'm also really liking the bold red with camel. another amazing outfit :) love the coat & dress!!! Love the coat, it's my favourite colour! I LOVE the dress!! And the jacket, both are amazing, and together even more so!!! this whole outfit is perfection! I can't decide if I like the dress, the tights or the shoes the most! Happy weekend! 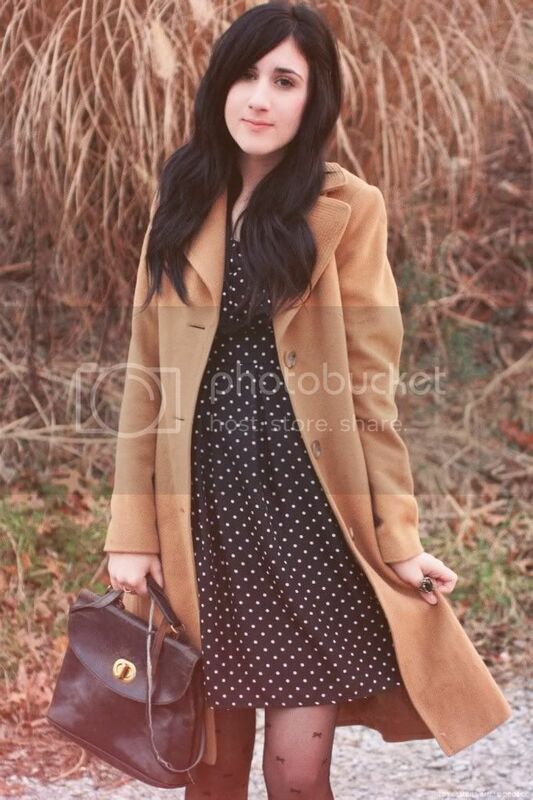 GAH, the simple dress, cute tights, red flats and camel coat look PERFECT together, color me inspired! in love with your red shoes. such a simple and classy outfit. you always have AMAZING style. those red shoes are perfect :)you look lovely as always! I thrifted a bag so similar to this the other day too, what a coincidence! How lovely this is! I need a warm camel coat, it's a great colour. The red shoes is gorgeous! beautiful coat. I love red and camel together. aww girl u so amazing. love your style& your blog. SO pretty! I really love this, the dress is just perfect! Amazing shoes.) You look so sweet!! Fantastic Looks and Outfits!! Follow you now!! very lovely photos. you have such a pretty face!! Love your hair too.